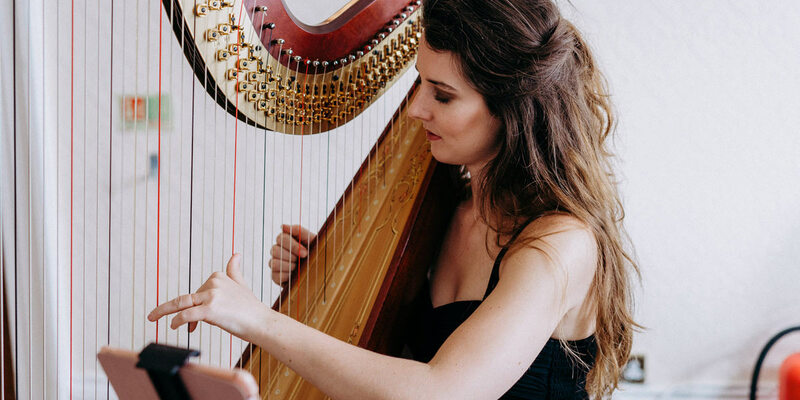 To breathe an extra air of elegance into your sophisticated soiree, Bands for Hire offers a miscellany of classically trained harpists for hire, many of whom come from high profile concert backgrounds. Proficient soloists in their own right, the sheer brilliance of these talented musicians blends beautifully into the ether, offering a serene soundtrack to your table talk. A popular choice for wedding ceremonies due to the dignified atmosphere their music creates, we at Bands for Hire would also recommend booking our harpists for drinks receptions, wedding breakfasts, private parties, restaurants, charity and corporate events.Whatever it is you have planned, you can rest assured that the seraphic strains of a harpist will raise the bar in terms of class and quietly wow your guests. The harp is blessed with a surprisingly diverse range for a solo instrument, and our harpists can turn their able hands to anything from classical music, Celtic folk and operatic arias to jazz standards, Disney theme tunes and rock and pop hits of the 1960s by such artists as the Beatles, the Byrds and the Animals. Our wedding harpists have typically enormous repertoires at their disposal and will therefore be able to tailor their sets to more specific tastes, often taking suitable requests to fortify the personal quality of their performance. Read on to discover more about our uncommonly skilled harpists for hire. For more wedding music options please feel free to take a look at our classical wedding musicians, from solo classical guitarists to string quartets.